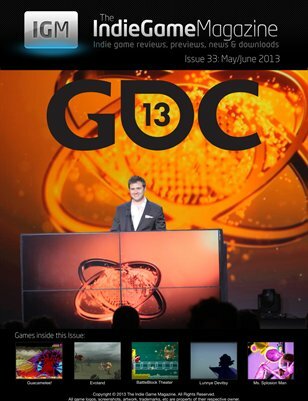 In this issue, we cover all of the great indie games of the Game Developer's Conference. We also talk about the winners and our favorites from the Indie Games Festival. If that wasn't enough, we have an in depth interview with 7 Grands Steps creator Keith Nemitz, a guide to IGF nominee Starseed Pilgrim, and an interview with Breakdance McFunkyPants. Finally, we have a slew of indie games reviewed inside this issue including Guacamelee!, Battleblock Theater, Shattered Haven, Evoland, Ms Splosion Man, Wake, and Lunnye Devitsy.